The Community Minibus plays a large part in transporting clients to the various services offered by Wye Valley Volunteers, including to the Luncheon Club and on shopping trips. This transport is arranged through the individual service. 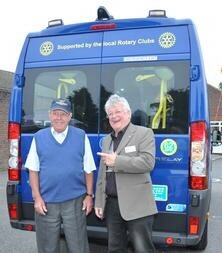 In addition we are proud to be able to make available the minibus for the use of our Local Community. • Air conditioning, tinted windows, seat belts. • Fully adapted for the carriage of disabled persons. • Facility to carry wheelchair passengers (training is required for the carriage of passengers seated in wheel chairs).